Now available as a Digital Edition! 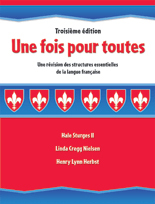 This highly acclaimed all-French grammar review text is ideal for intermediate or advanced French classes, AP preparation, or beginning college French. The 12 lessons include charts, explanations, and abundant practice for each grammar point. An accompanying Test Bank contains two tests per lesson to allow for pre- and post-testing. We’ve converted the print textbook into an online grammar review course. All the trusted content from the print edition is now reformatted so that students can complete all the activities using the Digital Courseware! What's in the Digital Courseware? Tools include creating classes, enrollment, assigning, assessment, add content, communication, and more! The Une fois pour toutes Digital Edition is available through the purchase of Student Licenses with durations that fit your needs: six months, one year, three years, and seven years. 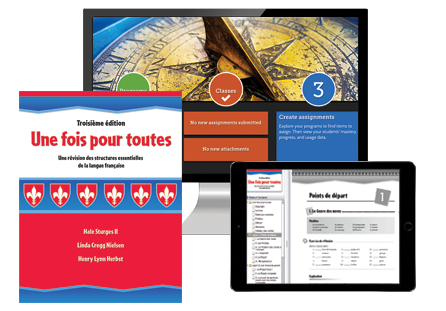 Learn about the Une fois pour toutes Digital Edition!